With Memorial Day weekend nearly here, the traditional beginning of the busy summer holiday travel season when millions of Americans head to the nation’s public lands for recreation, sightseeing, and appreciation of natural wonder, many travelers will encounter a system of failing infrastructure, eroding trails, and other inconveniences at their favorite national parks and monuments. Fixing the nation’s $11.6 billion National Park Service maintenance backlog won’t be easy, but a bipartisan bill proposing to reinvest around half of the nation’s energy development revenues on public lands back into park repairs might gain enough traction to begin rebuilding the nation’s public lands. The National Park Restoration Act, introduced by Sen. Lamar Alexander (R-Tenn.) would make half of “all revenues due and payable to the United States from oil, gas, coal, or alternative or renewable energy development on Federal land and water” available for use in a National Park Restoration Fund. “I think as a Secretary, it’s a fair proposition that if you’re going to gain wealth through energy development—whether it’s oil and gas, or wind or solar on public lands, then you too should have an obligation to maintain and support those public lands in perpetuity,” Interior Secretary Ryan Zinke said this month, describing the commitment and the critical nature of directing the revenues to public lands as his department’s budget makes its way through the Senate Appropriations Committee. The Alexander bill and its House counterpart have bipartisan support in Congress. The $11.6 billion maintenance backlog includes national parks, monuments, historic sites, and other public lands from every state. Senate cosponsors include Senators Martin Heinrich (D-N.M.) and Joe Manchin (D-W.Va.), along with Senators Cory Gardner (R-Colo.) and Steve Daines (R-Mont.). Led by Glacier National Park at nearly $154 million in projected maintenance needs, Montana’s $217 million tally is middle-of-the-pack amongst the Western states, where many of the nation’s most popular national parks are located. The numbers for Western states are, in a word, monumental: Alaska, $105 million; Arizona, $532 million; California, $1.809 billion; Colorado, $238 million; North Dakota, $52 million; New Mexico, $123 million; Nevada, $223 million; Oregon, $116 million; South Dakota, $66 million; Utah, $266 million; Washington, $399 million; and Wyoming, $702 million; for a total of approximately $4.6 billion, or 40 percent of the entire NPS backlog. Visitor numbers to the national parks have skyrocketed over the past several years. Popular destinations like Grand Canyon National Park, with a $329 million backlog, saw its average attendance of more than 4 million visitors each year between 1992 and 2014 jump approximately 1.5 million in just three years to 6.2 million visitors by 2017. Glacier National Park ($154 million) saw a 1 million visitor increase between 2014 and 2017. 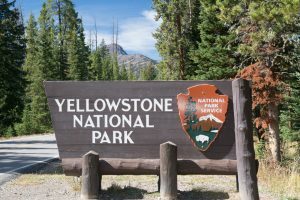 Yellowstone National Park, located across the states of Wyoming, Montana, and Idaho, with backlogs exceeding half billion dollars, has also seen and explosion in growth, averaging more than 4 million visitors each year since 2015. A Daines spokesperson explained the benefits of this bill’s approach to Western Wire, with the potential for billions generated for public lands infrastructure. The fund would be derived from 50 percent of incremental energy leasing receipts over 2018 Budget projections that are not otherwise allocated for other purposes. As the Department of the Interior works to expand Federal energy development on Federal lands and waters, this initiative has the potential to generate up to $18 billion over 10 years for parks and other public lands infrastructure. 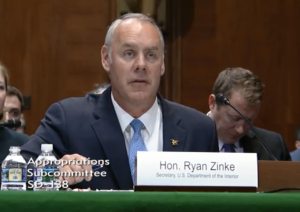 In March, Zinke told the Senate Energy and Natural Resources Committee that his department was poised for generating revenues through energy development proceeds that would generate much-needed funding for Interior legislative priorities, especially the backlog. “If you go back to 2008, Interior was the number two generator of revenue in this country behind the IRS [Internal Revenue Service]. It was a banner year but just in offshore oil and gas the revenue was about $18 billion a year,” Zinke said. “When we first took office it was atrophied down to about $2.6 [billion]—some was market conditions some was not. Given our growth, our projected income…we think we can do it in eight years,” Zinke continued. “All Americans should have the opportunity to enjoy a national park, but without an investment in our infrastructure to go along with the record-setting amount of visitors, we are loving our parks to death,” Zinke said. The Office of Management and Budget (OMB) has estimated the proposal would generate $6.8 billion, according to a spokesperson for Daines. Rep. Kevin Cramer (R-N.D.) told Western Wire that the backlog goes beyond maintenance and patchwork—it’s crucial for public safety and ensures continued public access. Rather than creating an entirely new revenue stream, Cramer argued, this “creative” approach redirects resources already collected for energy development on public lands and reinvests those monies into the public lands themselves. Zinke, speaking earlier this month, said the issue was not a partisan issue. “Our public land experience in this country is not a Republican, Democrat or independent issue, it’s an American issue. And there are certain things that should transcend partisanship,” Zinke told Alexander, the bill’s sponsor. “As we heard from the Secretary last week addressing deferred maintenance is a huge priority that requires significant, dedicated funding stream,” Hanabusa said in March. She pointed to the $12 million in maintenance requirements at Pearl Harbor and $85 million at Hawaii Volcanoes National Park as part of the state’s $153 million backlog. “Many of our parks are old,” Hanabusa said, pointing to the recent 100th anniversary of NPS. “It is our responsibility to ensure they thrive for many generations to come,” she said. A spokeswoman for the Natural Resources Committee told Western Wire that the lack of leadership on federal lands stewardship has led to the enormous backlog, but that the current bipartisan proposal could cut through partisan rancor and bureaucratic red tape. Schoettler called the bill a “step in the right direction” and noted that it represented a rare alignment of House, Senate, and administration priorities. Rep. 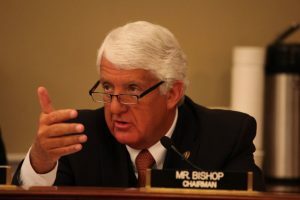 Rob Bishop (R-Utah), Natural Resources Committee Chairman, is another cosponsor of the bill. “The concept of using royalty payments from our productive BLM [Bureau of Land Management] lands to help with the maintenance backlog in our iconic National Parks is the essence of multiple use,” Edwards continued. “Utah is, always has been, and always will be a public lands state. Maintaining the beauty and productivity of those lands is paramount to our way of life. We support this and any thoughtful effort to better maintain Utah’s incomparable National Parks,” Edwards said.